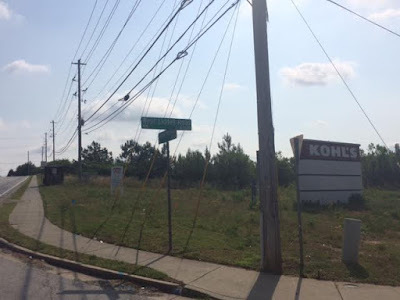 A Norcross based development firm is looking to build a gas station, two story convenience store, and a number of restaurant and retail spaces on a narrow strip of vacant land on Satellite Boulevard in Gwinnett County in Duluth. The project, referred to as "Satellite Corners," is located behind the Kohl's at Venture Drive and basically at the intersection of West Liddell Road and Satellite Boulevard. For another point of reference, the development is just north of the former Harry's Farmers Market, which is today home to the Aviation Institute of Maintenance. Five Partners, LLC is the development company behind the project which sits on roughly 1.69 acres. According to to county sources, the new center will consist of a roughly 16,000 square structure and 71 parking spaces. The property is reportedly in the process of being rezoned C2 to permit the development's construction. The gas station and C-store will both reportedly be branded Exxon, with the makeup of the half dozen or so other spaces as yet unknown. I was unable to determine how many gas pumps the gas station will have but I'd guess it will have 8 or ten. A four pump Citgo gas station, C-store and assorted other businesses are already open in an existing center directly across the street. Additionally, QuikTrip and Shell also operate 16 and 12 pump stations respectively, just north of the new development, at Satellite and Steve Reynolds Boulevards. Do you think the area needs another gas station? What other retailers or restaurants would you like to see open in this center? Do you still miss Harry's Farmers Market? I worked in this area ten years ago back in I guess you could say its peak. I seldom go back, but the one thing I notice is the number of empty or neglected business in need of redevelopment. It would seem the County would encourage the redevelopment instead of adding new space to an area that already has too much capacity. The area is undergoing redevelopment, slowly with a lot of Asian owned stores and restaurants opening, or in the process of opening over the past year or two. Will it ever be like it was 20 years ago? probably not, but you can say that about a lot of older malls as of late due to consolidations and closings.